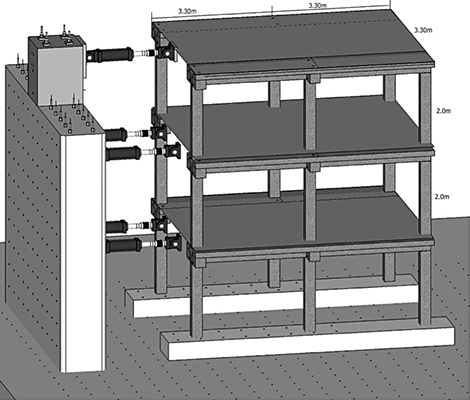 The proposed research focuses on the response of older reinforced concrete (RC) frames designed with smooth bar reinforcement and no or limited seismic design provisions. It involves near-full-scale (1:1.5) two-bay 2D frames with three storeys, in order to include a typical intermediate storey (the middle one), the ground storey with the connection to the foundation, and the top storey with the column bars terminating at the level of the roof. The 2D frames are involved in one-way frame action, due to in-plane seismic loading and response. They give the opportunity to test columns with vertical smooth bars either lap-spliced at all three floor levels – as commonly done in practice – or continuous from the foundation to the roof, in order to study the effects on the response. Moreover, the effect of FRP wrapping of the column end regions will be studied, by wrapping in FRP only the ends of one of the two outer columns in all three storeys and subjecting the test structure to a loading history fully symmetric in the two directions of loading (positive and negative), or first testing the two frames with all their ends wrapped in FRP and then repeating the test on the same test structure after removing the FRPs; in that case the level of loading should be low enough to avoid serious damage to the members; a second test at a significantly higher level should follow, to bring some of the unwrapped columns to ultimate conditions and beyond. The test results and the calibrated numerical models aim at providing information regarding the two most important properties of a concrete member for the purposes of seismic assessment and retrofitting, which are its secant stiffness to the yield point and its ultimate chord rotation under cyclic loading – identified in a test with the point beyond which resistance cannot rise above 80% of its peak value during the test.